Edward Andrew Thompson’s former girlfriend testified Tuesday a man in a bar told her that he, not defendant Larry Johnson, killed Thompson because Thompson had stolen cocaine from him. The girlfriend was a prosecution witness but defense attorney Norm Pattis seized on her statement to police that she had the barroom conversation a week after Thompson’s death. Johnson, 34, is charged with murdering Thompson, who was 37, on Grand Avenue Oct. 13, 2011. He also is charged with carrying a pistol without a permit. “This man told you, �I’m the one who killed Eddie’?” Pattis asked. The witness confirmed that was what he said. “He said, �I killed Eddie because he stole my drugs and I want my (expletive) money’?” Pattis asked. She confirmed he had said this, as well. When asked by Pattis if the man at the bar was Johnson, she said it was not. 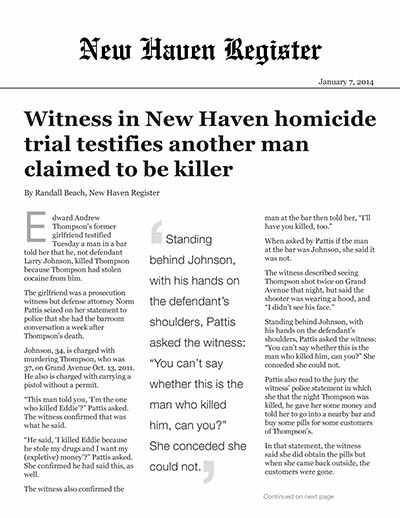 Standing behind Johnson, with his hands on the defendant’s shoulders, Pattis asked the witness: “You can’t say whether this is the man who killed him, can you?” She conceded she could not. Pattis also read to the jury the witness’ police statement in which she that the night Thompson was killed, he gave her some money and told her to go into a nearby bar and buy some pills for some customers of Thompson’s. In that statement, the witness said she did obtain the pills but when she came back outside, the customers were gone. After Pattis read aloud the four-page excerpt of the witness’ police statement, she could not answer his follow-up questions. But the witness said she was not drunk as she was testifying. Prosecutors are trying to prove Johnson was angry because he had been stabbed by “a white boy” during a street argument and that Johnson then shot Thompson in a case of mistaken identity. The jurors Tuesday heard testimony by a man who said he was actually the person who stabbed Johnson. The man said he was a heroin and crack addict at the time and was on Ferry Street in Fair Haven that night, having a physical argument with his girlfriend, a prostitute. The man stepped down from the witness stand and, using Pattis as a model, demonstrated how he had gone down on one knee and allegedly stabbed Johnson in his lower back. The man’s girlfriend also testified Tuesday, saying she got into the back of Johnson’s car and heard the two men fighting outside. She said she knew Johnson. When Johnson got back into the car and drove off with her, she testified, he told her he had been stabbed.